It should be entitled: “Why everything about Fitzgerald’s Rubaiyat is wrong.” It was published in 1967, so perhaps some of the issues it raises are closer to being resolved. 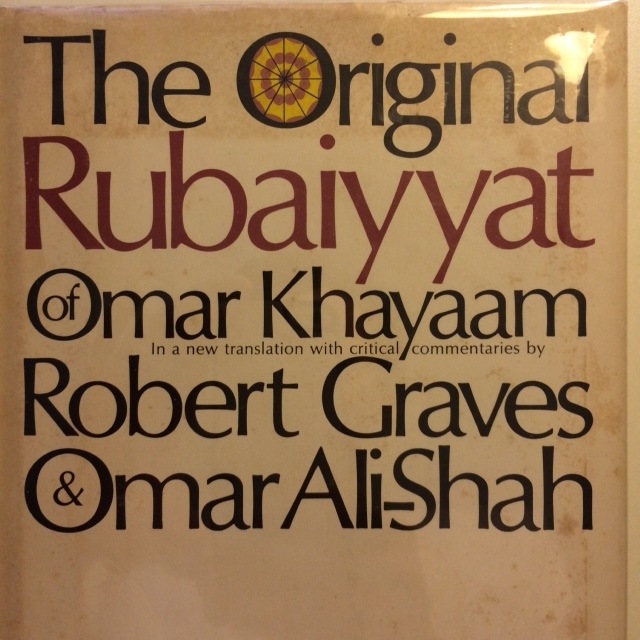 Or perhaps scholars have ceased to care: the Rubaiyat fad is over. Graves teams up with Omar Ali-Shah, a Persian scholar, whose family owns the manuscript that serves as an earlier and therefore allegedly more accurate source. I read two of Graves’s most popular works of historical fiction: I, Claudius and Claudius the God (both of which I would recommend if you’re curious about Roman history). Graves (1895-1985) was a poet, scholar, writer and translator, WWI soldier and author of many works. What about all the references to wine and drinking? Well, they can be explained by way of subtle Sufi metaphor: it’s only a figurative drunkenness that Khayyam speaks of — what he is really referring to is the intoxication of divine love. I’m not sure I buy it. The co-authors make some valid points — especially about the liberties Fitzgerald took — but nevertheless, their petulant tone and personal attacks undermine their argument. If you read between the lines, it’s also not clear that their premise is even accepted by a majority of scholars in the field. I fear that interpreting Khayyam is as fruitless as interpreting Jesus. I could plunge into a study of early Christianity, learn ancient Greek, and still not arrive at definitive answers. Turning to existing authorities, I would encounter a range of biases — can scholars of religion truly be dispassionately objective? It seems everyone wants to claim Khayyam, be it Epicurean Englishman, mystic Sufi, or angry atheist. And Khayyam’s skepticism of religious authorities is apt to raise the hackles of pious Muslims and uptight Christians alike. It makes me throw up my hands in despair! The biggest argument I can make against “The Original Rubaiyat” would infuriate this sincere, if overzealous duo: Fitzgerald is more fun. I don’t care about poetic credentials — or even accuracy! — Graves’ translation can’t compete! A cook doesn’t get points for accurately following the recipe of an ancient chef: diners only want to know if it tastes good now. Millions and millions of people ordered the Fitzgerald special. Sure he left out a lot of ingredients, and added some of his own, but people are still savoring his dish.